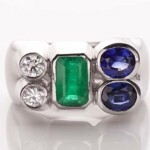 This is a very fine Trilogy ring made with two Round brilliant cut Diamonds and Em cut Emerald along-with two Oval shape Blue sapphires set in Platinum for KAMLA YOGH, Success, Prosperity, Luxuries, Professional independence, Financial Independence, Properties, Assets, Economical success, Rising, Performance, Achievements, Rewards, Determination, Creativities, Vision and Drive. This ring is apt for natives whose rising sign ascendant Capricorn, Aquarius, Taurus, Libra & Virgo. It works as a defence mechanism against any crisis and leads to a rise in luck, prosperity and establishment. In Vedic astrology Blue sapphire is related to the planet Saturn; Emerald represents the planet Mercury and Diamond represents the planet Venus. According to the teachings of this ancient knowledge, the best gemstones to be used for amplifying the beneficial properties of the planets are those which are as pure, transparent and flawless as much as possible. Indeed such gemstones are naturally hard to find but in light of their fantastic effect on the wearer it is well worth the extra effort. These stones are also referred to as the gemstones of destiny. They bring mental clarity, and clear perception and also contribute to the wearer being financial independent.